Last weekend I had the good fortune to take a beginner weaving class with Rabbit Goody of Thistle Hill Weavers. Some of you may know that Rabbit is an extremely well known and highly respected weaver, with an extensive knowledge of her art and so many related topics and disciplines. For a more complete portrait of who she is and what she has done, click here. Rabbit is a fellow Beekman 1802 artisan, and it was through Beekman 1802 that this particular class was offered. The extremely imperfect scarf shown at left was the result of my first go at weaving, showing many errors on my part, but I fully intend to wear it anyway as a reminder of this fantastic experience and some of the larger life lessons it brought to mind. Rabbit is a generous, patient, and effective teacher. It is nothing short of miraculous that she is able to take a room full of absolute beginners and, at the end of two days, send them off with wearable, lovely silk & worsted scarves of their own making. Mine was by far not the best example in the class; one in particular looked flawless to me. While as a student I was mainly focused on process, not result, I know that when I am teaching I take a certain amount of satisfaction in seeing my students produce something truly beautiful. I think Rabbit does too, and she certainly achieved successful results. I think there are often life lessons embedded within any creative pursuit, and weaving is no exception. Here are just a few that came to mind as I learned the rudiments of weaving. Small actions can have lasting consequences. We spent the entire first day of class learning how to wrap the warp and set up the loom. I had previously known nothing of the painstaking work required to prepare a loom for weaving, and these were relatively simple four-harness looms suitable for beginners. Once the warp was placed on the loom, we needed to carefully thread each heddle in the correct order, one strand at a time, to achieve the correct pattern in the final result. Following that, each thread had to come through the reed in the correct groupings. Needless to say, for a beginner it is very easy to make a mistake at some point in this process, and I did. A couple of my errors were visible right away to Rabbit, who corrected them, but another was only apparent once the weaving began. Rabbit was able to fix the latter to some extent, but there is still an imperfection all along the warp in that section of the scarf, a reminder that just one small mistake can have lasting consequences. But I don’t want this to only be read in the negative. It is also true that one positive act can have far reaching and lasting consequences for good. There is a ripple effect in many things that we do, and being focused and present even in the smallest of things can matter a great deal. Bringing your best to whatever you do is a wise investment and multiplies your efforts. Rabbit provided us with beautiful silk and worsted thread with which to weave our scarves. She knows what I also know as a teacher: if you do not provide your students with the best materials for their very first project, they will not get a result that will encourage them to continue in the art. Additionally, they may actually have a harder time learning, because cheap, low quality materials do not perform well in an artisan’s hands and can be uncomfortable and frustrating to work with. Whether you’re a beginner or a master, bring your best to every endeavor and share that best with others if you want your message, your passion, your art – whatever it is – to become a contagious force for good. Sometimes, we seemingly create something from nothing, and when we do, it is deeply rewarding. One of the many wonderful conversations that took place over the weekend was about the almost inexpressible satisfaction that comes from having a real, three dimensional, thing of beauty come in to being under your own hands. Ideas are powerful. In the course of our weaving weekend, ideas became scarves. In my own work, a fleeting glimpse of a landscape or the issue behind a protest may take root in my mind as an image or an idea. From there it will make its way on to paper as a sketch, then on to linen as a pattern, then through wool and handwork it ends up a work of fiber art, tangible, tactile, real. All it was at its inception was an idea, and it becomes a physical thing, but it doesn’t end there. It becomes a thing that generates more ideas and feelings, and may even become part of someone else’s story, which may in turn generate more inspiration that becomes some other new thing. Archaeologists have unearthed woven fabric that is thousands of years old, fabric that started out as someone’s idea. This manifestation of creative thought presents itself thousands of years after the death of the thinker. In some ways, creative making is the closest we get to immortality while also being reminded of our own personal impermanence. Don’t judge anything too early in its story. The hookers in the audience know that it’s impossible to truly judge a rug prior to the steaming process. In fact, when I teach hooking, I confidently promise my students that upon steaming, their rug will subtly, and yet dramatically (yes, I mean that contradiction), change for the better. Imagine my delight to find out that finishing is equally – possibly more – important in a woven piece. Rabbit taught us a variety of finishing techniques for our scarves. In the case of mine, she sprayed it gently with water and ran it through a vintage rotary iron. After the steam pressing, she handed me my scarf and it was amazingly, tangibly, thrillingly transformed. It was softer, my weaving errors were less apparent, it had developed more of a sheen, and it was just significantly different. This is a great reminder that often it is best to withhold judgment, especially during moments we are most compelled to judge. Judging too early can lead to giving up too soon. It can lead to unfairly dismissing a project, an idea, or at worst, a person, long before we have enough information or legitimate reason to. Believe you can. To be honest, when I first signed up for Rabbit’s class I was not at all sure that I would be able to come home with a scarf even as good as the one I have, even with the mistakes its sporting. Weaving is a precise, intricate, mathy, technical, and yet endlessly creative art form. It seems to me to require a Renaissance mind, one that is equally comfortable with traditionally left and right brain thinking. I am infamously weak with mathy pursuits. I somehow passed calculus in college, but I remember none of it, with the exception, perhaps, of the trauma the class inflicted on me. I knit…a little…but, oh please, do not ask me to design a knitting pattern or fix an error three rows back. My chosen art, the one I’m so passionate about, is way more abstract, like painting with wool. I can handle that with relative ease. Why on earth would I think I could do something with such strong spatial and technical components? Well, on one hand, I correctly believed that Rabbit was simply a fantastic teacher and that she’d seen the likes of me before. On the other hand I simply chose to believe that I could do this. This is a discipline in itself, and one I learned later in life. As humans, we really do have limitations, innate characteristics that might really prevent individuals from doing some things. However, I believe that we have to sort out the real limitations ( I will never be an Olympic athlete) from the lies we tell ourselves (I’m not left brained enough to weave). The best things that have happened to me in the past several years have come about because I’ve learned to silence the inner voice that fabricates limitations, and listen to the one that objectively recognizes realistic opportunities and possibilities. Creating things creates community. This needs very little explanation. On Saturday morning, we four students and Rabbit had never met before and, except for Rabbit, had never woven before. By the end of the weekend we had chatted about our lives, our families, things we love to do, and watched and supported one another with the challenges of learning a new art. We shared our experiences to our wider communities on social media and spread the word about this incredible workshop. Today I showed my new scarf to our Tuesday hooking group, and the circle became wider. Humans are innately driven to create and share in the creative process, and I have to think that this is not only because that drive is somewhat evolutionary – a means to physical survival – but also because it binds us together in communities that meet our needs for connection and belonging. There are so many more lessons within the lesson, but these were foremost in my mind as I drove the six hours back to Maine from upstate New York. I am very grateful to Rabbit for sharing so much of her time and resources with us, and to Josh and Brent of Beekman 1802 for arranging this experience. I am also grateful to my three weaving classmates who were inspirational in their own right, creating beautiful things out of “nothing” as well. If this is something that would interest you also, follow Thistle Hill Weavers on Facebook where Rabbit posts her upcoming classes. 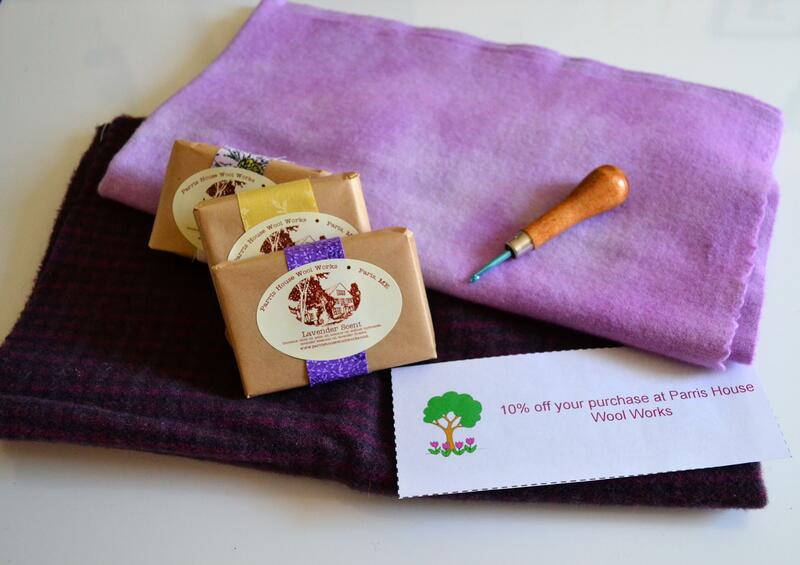 Also follow Beekman 1802 on Facebook for notifications of other upcoming Artisan Experiences as they are offered. Upcoming Classes in April at the Maine Studio! Join Us! One of the things we promised to do in 2015 was offer more educational classes in a variety of great crafts and skills. So here we go! Here are some brand new offerings for April. Space is limited for each class, so please contact me (Beth) at 207-890-8490 or at ParrisHouseWoolWorks@gmail.com to sign up! 10 am to 3 pm. Who doesn’t want to make an adorable May basket just in time for Spring!? 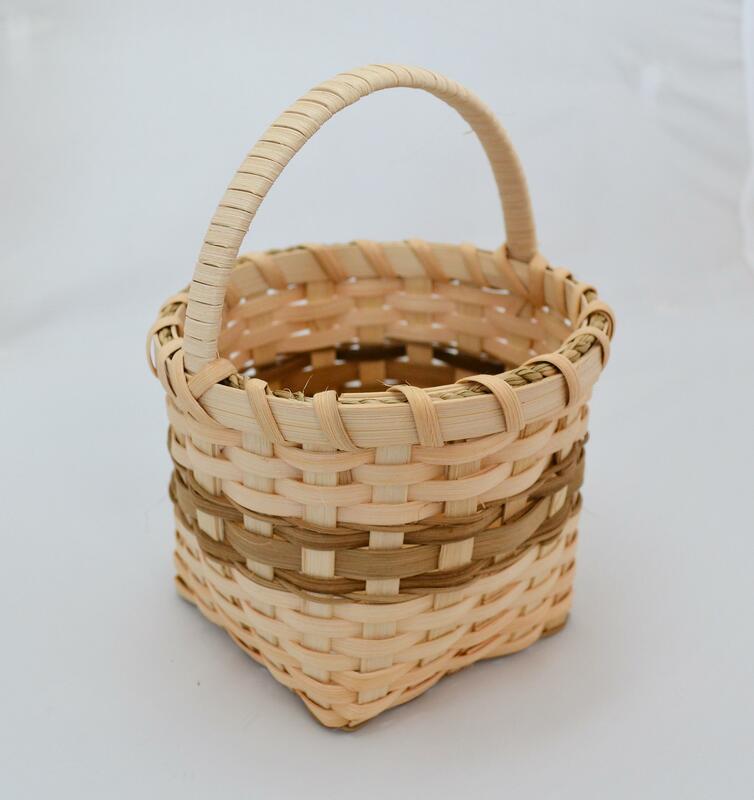 This basket can be made in a variety of colors. Karen will bring many colored reeds to choose from! The $30 class fee includes all materials needed. Just bring yourself and a bag lunch! Snacks and beverages will be provided. Space is limited to 12 students, so sign up soon! 9:30 am – 3:30 pm. 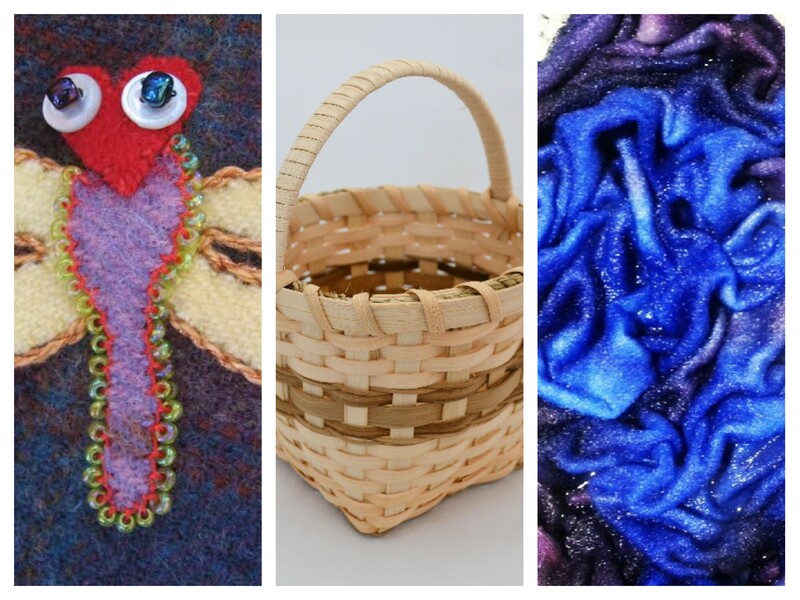 Join us for a wonderful penny rug/applique class with fiber artist Mary DeLano (see her artist profile here: https://fibercollege.wordpress.com/2014/07/08/artist-profile-mary-delano/). Mary goes beyond the blanket stitch in this class suitable for beginners and also those who want to learn new stitches and techniques for penny rug making. 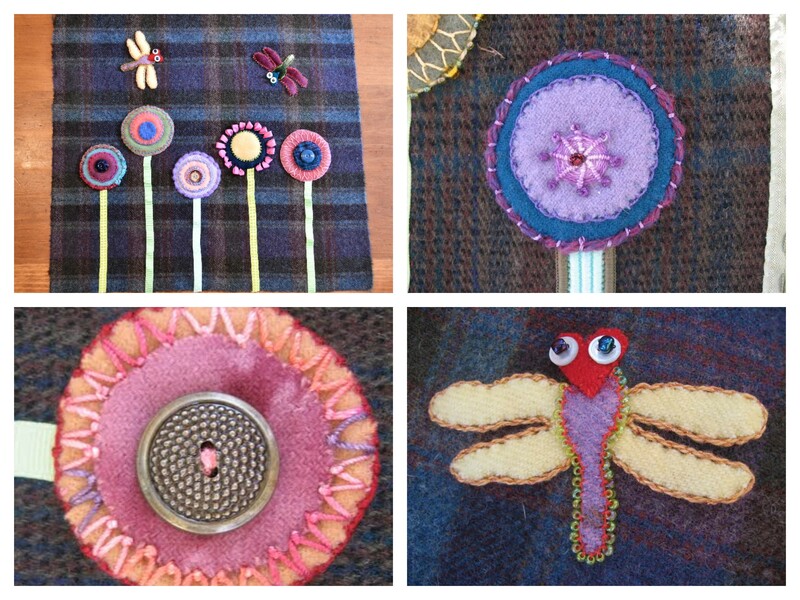 Mary will provide her expertise, embroidery floss, ribbon, and other notions as well as some wool materials. Students need to bring the wool for the background and any scrap wool they might like to incorporate in to their design, and a pair of scissors. We also have plenty of wools and scraps at the Maine studio to choose from. Class is $45. Please RSVP to secure your spot! 9 am to 12 noon. 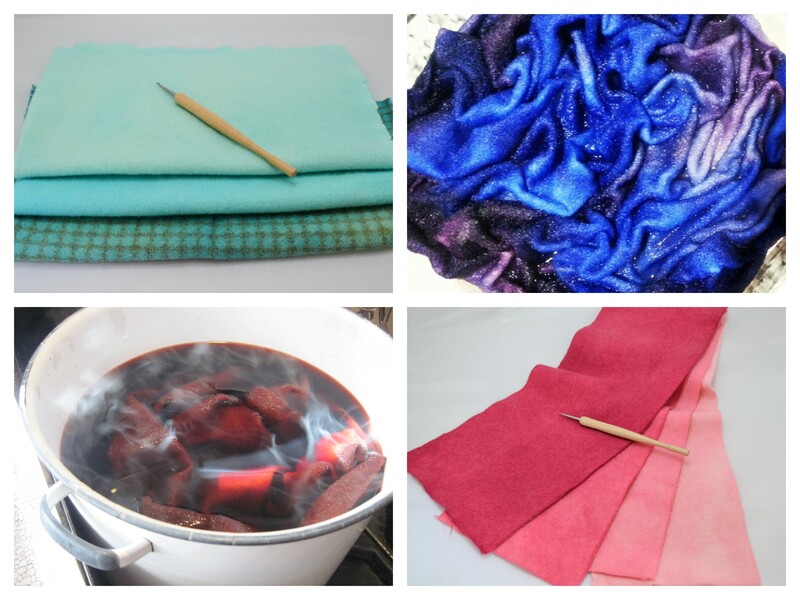 We will introduce pot dyeing, microwave dyeing, and casserole dyeing in colors of your choice, and maybe make new recipes with experimentation! Class including materials, $32. Space is limited to four students. This one is almost full right now, so don’t hesitate! I will continue to post class offerings here, but you can also always go to our Workshops & Classes tab to see what’s scheduled for the year. Hope to see many of you in the studio!